Vaccinations help protect against viral & bacterial diseases and are one of the most important preventive measures you can take for the health of your pet. At some time in its life, your pet may be exposed to a serious or even fatal infectious disease. Without proper vaccination, it's left unprotected. Paws 'N Claws Veterinary Clinic offers a personalized approach to vaccinating your pet based on age & lifestyle (how much time your pet is indoors or outdoors, the degree of contact with other animals, etc). So, the more you tell us about your pet's lifestyle, the better prepared we'll be to recommend the vaccination program that is best for your pet. Distemper Combo - This vaccination includes several viral agents important for the health of your pet. (Distemper, Adenovirus, Parainfluenza & Parvovirus). The puppy series will be given at 8, 12, and 16 weeks. Annual boosters will be given until 3 years of age. After 3 years of age, boosters will be given based on your dog's lifestyle. Rabies - Rabies is always fatal when contracted. Since there is no cure, prevention by vaccination is the only solution. 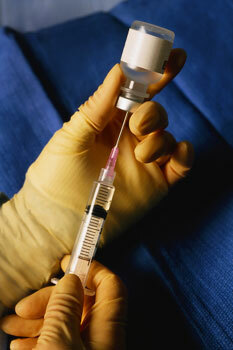 Vaccination is extremely important and required by law, as rabies can be transmitted easily to humans. Dogs must be 16 weeks of age or older to receive their first rabies vaccination. This vaccination protects your pet for one year. All subsequent rabies boosters are valid for three years. Bordetella - This vaccine protects against upper respiratory disease that is best described as bronchial pneumonia (kennel cough). We recommend a bordetella vaccination if your dog attends training classes, puppy kindergarten, goes to the dog park, is kenneled or goes to the groomers. Most groomers, kennels & training centers require this vaccination. It is available in injectable or intranasal form & requires two vaccinations 1 month apart to start then a booster is given every 6 months for dogs with high contact - day care, training, etc. Dogs that are kenneled a couple of times a year will be given a 1 year vaccine. Leptospirosis - Given only on a case-by-case basis. This bacterial infection results from direct contact with infected urine, biting, or ingestion of infected meat, and it can be transmitted from pets to humans. Two vaccinations are required 1 month apart, then an annual booster is given. Distemper Combo - This vaccination includes several viral agents important for the health of your pet. (Distemper, Rhinotracheitis & Calicivirus). The kitten series will be given at 8, 12, and 16 weeks. Boosters will be given annually until 3 years of age. After 3 years of age boosters will be given based on your cat's lifestyle. Rabies - Rabies is always fatal when contracted. Since there is no cure, prevention by vaccination is the only solution. Vaccination is extrememely important and required by law, as rabies can be transmitted easily to humans. Cats must be 16 weeks of age or older to receive their first rabies vaccination. This vaccination protects your pet for one year. All subsequint rabies boosters are valid for three years. Feline Leukemia - Recommended in all outdoor cats, indoor/outdoor cats and indoor cats that have contact with outdoor cats. This vaccine is only to be given once your cat has tested negative for feline leukemia and has had no chance of re-exposure (outside unattended since test was negative and never vaccinated). Two vaccinations are required 1 month apart, then an annual booster is given.